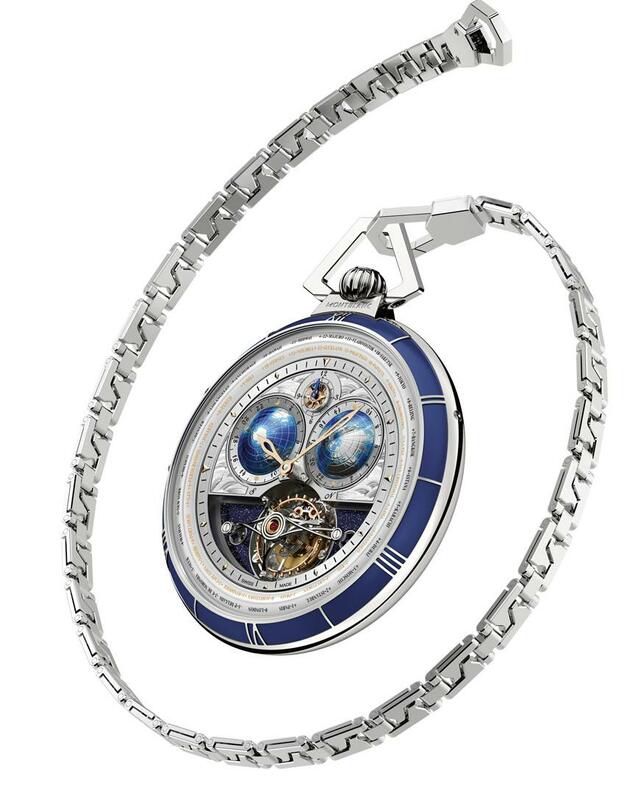 To celebrate the Maison's 110th anniversary, Montblanc has chosen to honour travel across the Atlantic Ocean and the ultimate precision of marine chronometers, both essential parts of this pioneering spirit, with two unique horological creations: a limited edition of eight Montblanc Collection Villeret Tourbillon Cylindrique Pocket Watches 110 Years Edition and a one-of-a-kind Villeret Tourbillon Cylindrique Pocket Watch & Navigator 110 Years Edition. 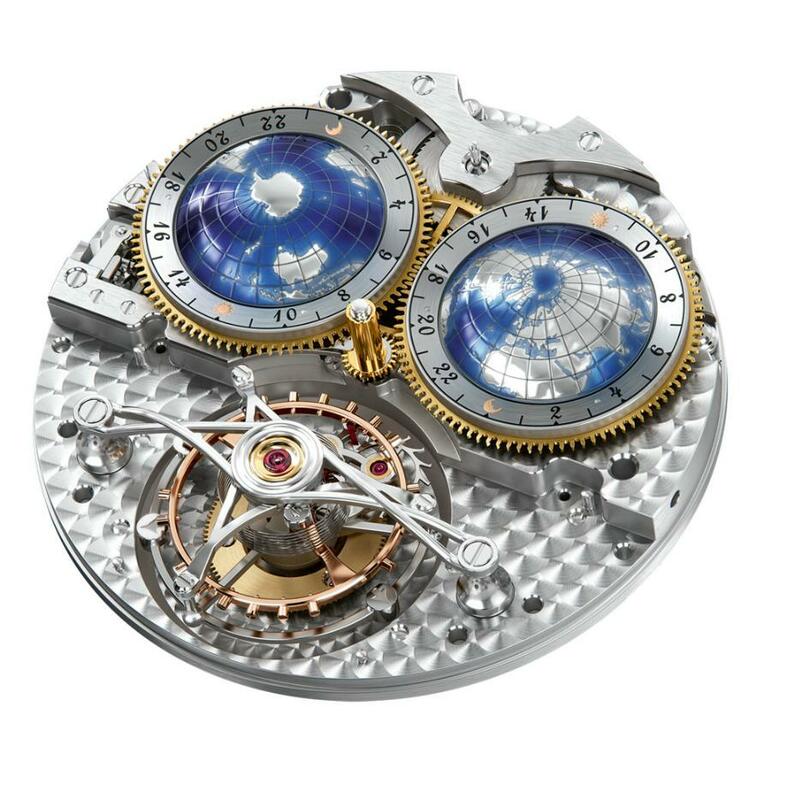 The Montblanc Collection Villeret Tourbillon Cylindrique Pocket Watch 110 Years Edition 8 pieces features some of horology's most innovative complications, including a tourbillon with cylindrical hairspring, a triple time zone indication, and a worldtime with both the Northern and Southern Hemispheres. The challenge for Montblanc's watchmakers in the fabrication of this balance spring was to miniaturise the cylindrical hairspring, which was obviously much larger and higher in traditional marine chronometers. However, thanks to the expertise of the Montblanc Manufacture in Villeret, its specialists were not only able to fabricate a miniature cylindrical balance spring, but they found solutions to include two Phillips terminal curves as well. These upward curves at each end of the spring significantly improve the regularity of the balance spring's breathing, thus further improving isochronism and resulting in utmost precision. The hand-wound one-minute tourbillon calibre MB M68.40 -- with its 281 components (91 components for the Cylindrical Tourbillon and 77 for the Worldtime complication) and 48-hour power reserve -- features a number of unprecedented functions, including a triple time zone indication. Local time is represented by two 18K red gold hands in the centre and the home time is indicated by a Fleur-de-Lys hand that sweeps around a three- dimensional 12-hour compass rose at 12 o'clock. For the worldtime, a pair of three- dimensional globes depict the 24 time zones in the Northern and Southern Hemispheres, along with the passage of the days and nights. The 24-hour worldtime and day/night indicators make a full rotation in 24 hours around the fixed globes. The disc for the Northern Hemisphere turns clockwise, where its counterpart in the Southern Hemisphere turns anticlockwise. This configuration allows an instant view of the day and night on both sides of the world. With the aid of the meridians of longitude, the user can also read the current hour in any desired part of the world by following the 24-hour worldtime display on the two discs. The indicators on the Montblanc Collection Villeret Tourbillon Cylindrique Pocket Watch 110 Years Edition 8 pieces can be set via the crown and the two inset correctors on the case's flank at 2 and 10 o'clock. 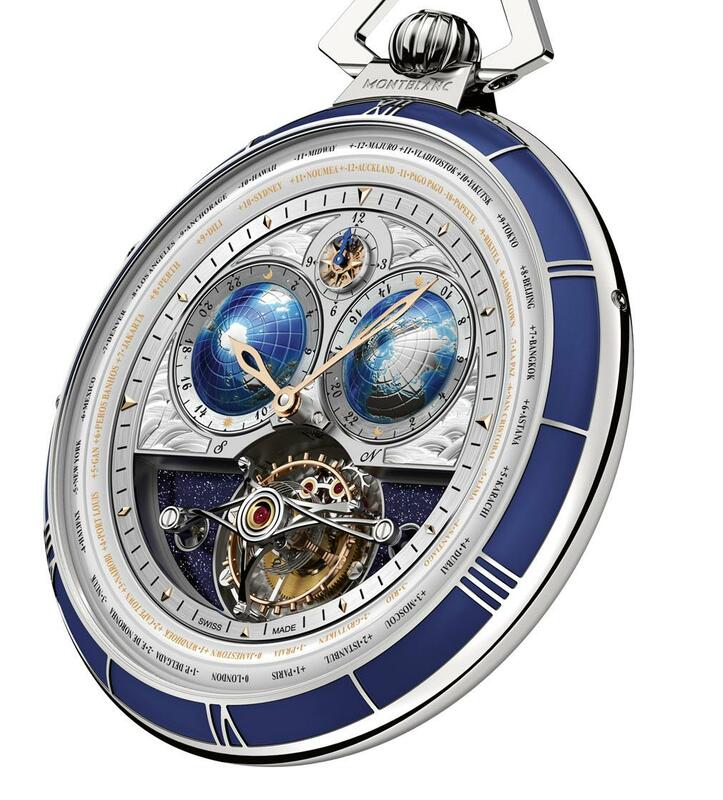 After pulling the crown outwards, the owner can set the local time and simultaneously adjust the worldtime display along the two globes' 24-hour scales. The corresponding correctors on the case are used for the fine adjustment of the local time in the centre and the home time in the compass rose at 12 o'clock, which runs along with the local time. Once all indicators have been correctly synchronised, a new local time in a different time zone can be set simply by pressing the inset corrector at 2 o'clock. Operating this corrector advances only the hour hand in single-hour increments. It does not affect the minutes, which are shown from the dial's centre, nor does it alter the home time at 12 o'clock or the two displays along the globes. When travelling, the user then only has to press on the inset corrector at 2 o'clock until the new local time zone is reached, without affecting the other indications. This simple correction enables the user to read the local time in the centre, the home time in the compass at 12 o'clock, and the time anywhere else in the world by simply glancing at the two 24-hour discs around the hemispheres. The large sophisticated three-dimensional dial, constructed in different parts and on different levels, features a number of traditional artisanal decorations. Starting with the tourbillon at 6 o'clock, this intricate high complication draws the eye into the timepiece, thanks to its three-dimensional arcing, convex tourbillon bridges, which are slightly curved to match the contours of the globes. It takes more than two weeks just to hand- bevel and polish the top stainless steel bridge, an art that only a few watchmakers still carry out by hand in this artisanal way today. The two hemispheres are also of particular interest, as they have been crafted using a combination of engraving and miniature painting that shows the continents in relief with their outlines, borders, longitude and latitude lines, seas and oceans. The names of the 24 cities in both the Northern and Southern Hemispheres are indicated in a domed flange encircling the dial, along with a precise minute track embellished with red gold-plated applied indexes, lozenges and triangles. Other noteworthy features include a three- dimensional 12-hour compass rose, made out of four 18K red gold hand-bevelled parts that indicate the home time with a blued Fleur de Lys hand, and 18K red gold hour and minute hands that indicate the local time, all while flying above this spectacular scene. The engraver's art continues onto the back of the hand-wound movement calibre MB M68.40, which is on full view through a large case back. The same artisanal hand- engraving expertise is applied to the hand-crafted bridges that have also been decorated with this unique wave pattern. The waves adorning the lower part of the movement are relatively calm, but they get increasingly choppy towards the top of the calibre, paying homage to the pioneering spirit of the steam ships that crossed the dangerous Atlantic Ocean at the beginning of the 20th century. 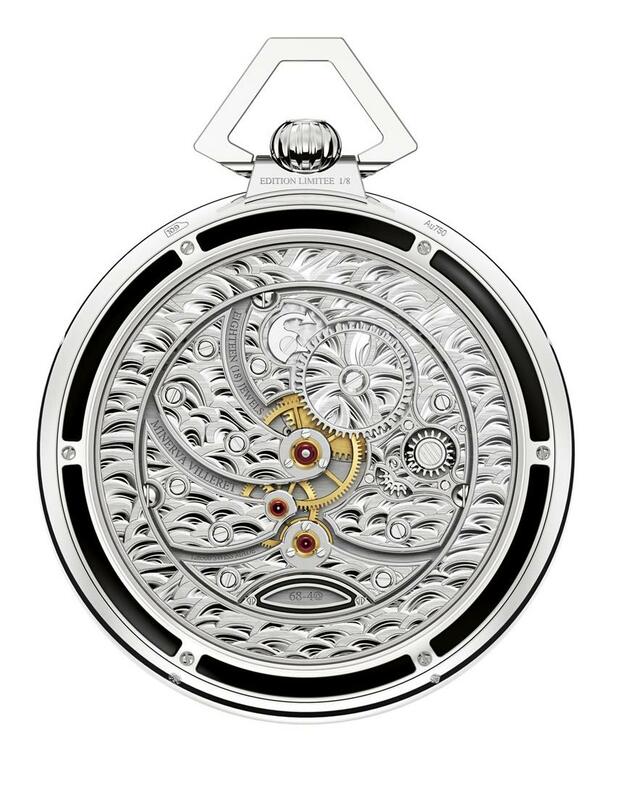 The hand-wound movement is further decorated with a horizontal satin-finished main plate, traditional bridges featuring the pomme shape, inner angles, exquisite bevelling, a seal with the hand-engraved calibre number decorated with black enamel, and a mirror-polished pawl with the hand-finished Minerva arrow--all pushing the limits of traditional horological aesthetics. The 60 mm polished white gold case is also a work of art with its pebble shape that is reminiscent of the refined watches of the early 19th century. A five-sided shackle matches the design of the attachment of the 18K white gold chain and each link of the chain features the "M" of Montblanc in an elegant design of aesthetic refinement. On the case, black Grand Feu enamel highlights the Roman numerals for maximum legibility, while another black Grand Feu enamel adorns the case back. The art of enamelling in watchmaking dates back to the 17th century and was historically used at the Minerva Manufacture for the dials of its stopwatches and chronographs. The use of enamel preserves this rare craft that requires the mastery of highly developed artistic talents and technical skills. Completing the case is a traditional fluted crown with a Montblanc emblem in relief at 12 o'clock and the limited edition number hand-engraved just below the shackle on the case back, as a reference to this highly exclusive limited edition.